Regular soaps tend to irritate dry skin and cause itchiness in the skin because they strip the skin of all of its moisture. In case you want to avoid such an effect and want to nourish your skin while bathing, you should use soaps especially made for dry skin, or better still, a shower gel that is more effective in retaining the moisture of the skin. A shower gel or a body wash that is made for dry skin is normally creamy and comes with moisturizing agents like cocoa butter, avocados, milk cream or oils of olive or coconut. These shower gels help in cleansing your skin during every bath and replenishing the lost moisture in the skin. A bottle of shower gel will last you a good 2-3 months and can be a wise purchase if you want to get rid of dryness from soaps. To help you choose a shower gel for your dry skin, we have compiled a list of the best shower gels for dry skin in India. Take a look. 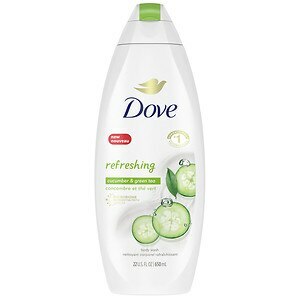 The Fresh Moisture variant of the Dove Body Wash contains hydrating milk with a cucumber and green tea scent. The lactic acid from the milk destroys the dead skin cells and gives your skin a renewed glow. The cucumber helps in keeping your body hydrated while green tea prevents any damage from free radicals. It is priced at Rs. 150 for 200 ml. The Nivea Creme Soft Shower Cream is a nourishing and silky cream that has the Hydra IQ moisture technology that leaves the skin feeling soft. The almond oil in the shower cream nourishes the skin and keeps it supple. It is priced at Rs. 145 for 250 ml. The Khadi Rose and Honey Body Wash is a soap-free cleansing gel that will leave your skin feeling refreshed with a hint of rose fragrance. The honey in the body wash helps trap moisture into the skin. It is priced at Rs. 130 for 210 ml. 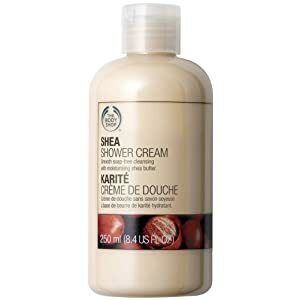 The Body Shop Shea Shower Cream is a soap free cleanser that has a rich, creamy and skin softening lather and a classic clean fragrance. The shea butter used in the cream is rich in Vitamins A and E which nourishes the skin and replenishes the moisture even in very dry skin. It is priced at Rs. 420 for 250 ml. The Olay Ultra Moisture Body Wash is a soap-free formula with shea butter that moisturizes even the driest of the skins and keeps it hydrated throughout the day. A bottle of the shower gel has the goodness of 1 jar of moisturizer in it. It is priced at Rs. 240 for 400 ml. 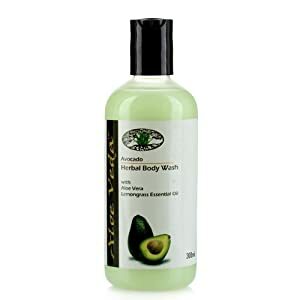 The Aloe Veda Avocado Body Wash is rich in avocado extracts which help in repairing the dryness of the skin. It also has mint and lemongrass blended into the formulation whose fragrance gives your day a zesty fresh start. It is priced at Rs. 180 for 300 ml. The Vivel Luxury Creme Olive Butter Deep Nourishing Body Wash is ideal for dry skin since it has butter from the olive fruit. The exotic and luscious butter pampers the skin and makes it silky soft. The shower gel is priced at Rs. 65 for 125 ml.